Sometimes your friends are so talented that you feel you need to break their thumbs so that they slow down long enough for the rest of us to catch up. I'm playing a wedding in July at Slane Castle (short version, four years ago I was asked by two friends to be their wedding DJ, but neither had a boyfriend at the time. Six months ago one suddenly acquired a fiancee, and I found myself with gainful employment, huzzah! ), and the rig I will be using, or at least the speakers their of, have been hand-built by Cravings, a good mate and part of the Audio Terrorists crew. Think about that, hand built speakers, from scratch. He's posted a set of photos outlining the process to a forum we use, and I hope some day he'll put it all on-line for other folks to follow. Posting instructions on-line allows a community to develop ideas further. 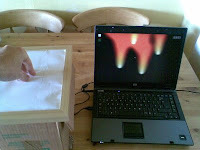 This morning another friend, Renus, sent round photos (shown above) of his new Multi-Touch controller, built out of paper, a cardboard box and a webcam. Based on the instructions for the MTmini posted online by Seth Sandler from UC San Diego, Renus is in the process of tweaking it to work with Abelton Live. I remember watching the videos from this year's TED that showed a digital whiteboard made for less than $100 using a WiiMote and being amazed at how accessible the technology has become since we first saw the ReacTable used by Bjork, Microsoft demoed their Surface, or even since JazzMutant released the Lemur back in 2006. I picked up an iPod Touch mainly because of the possibilities of its use as a low cost multi-touch controller for music software, but seeing what Renus has managed to do in a matter of hours makes me think the future will be made at home. "...the fused method that results, at once aesthetic and scientific - intuitive and deductive, sensual and analytical, comfortable with uncertainty and able to frame a problem, embracing nature in its complexity and able to simplify to nature in its essence - is what I call artscience"
Edwards argues for the breaking down of barriers between the arts and science, and founded Le Laboratoire in Paris as a workspace for scientists, artists and academics to come together and cross-pollinate. It works closely with the MIT Medialab, and I had an opportunity earlier this year to catch up with a few of its members who were visiting the Science Gallery in Trinity, and was very excited by the areas they were exploring. However you don't have to travel as far as Paris to find research aimed at blurring this line between arts and science. I caught up last week with 2Bit, who has forsaken Dublin for the wilds of Belfast to take Digital Musical Creation to the next level, and is undertaking a PhD in the Sonic Arts at the Sonic Arts Research Center in Queens. He's been working on incorporating feedback from an audience's emotions into live musical performances, and had just returned from NIME08 (New Instruments for Musical Expression) in Genoa where he presented a poster on the subject. The basic idea is to use sensors to capture live data from an audience as they listen to music, and then use that data to determine their mood and changes in mood, feed that data directly into the live composition of the music itself, changing it and allowing the audience to become part of the music creation. He'll be talking more about it at the International Computer Music Conference (ICMC08) in Belfast in August, and I'm going to try and make it up there to check it out. With friends like this, it makes it very difficult to get out of bed in the morning, knowing that no matter what I do, it's still not going to be as cool as their stuff.